This is a really comfortable general purpose thinning shear for an unbeatable price! 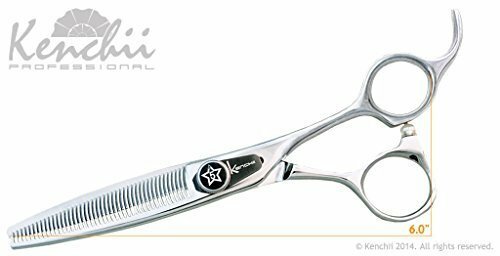 A 44 tooth thinning shear can remove bulk without changing the style and shape of the cut. The offset handle is designed to fit comfortably in your hand and the action is very smooth with this shear. This would be an ideal shear if you don't do a lot of detailed work with a finishing shear, but you do need one from time to time. It would also be a great general purpose thinner. The edge is a durable bevel and extremely sharp. The finger rest is removable and the tension is adjusted easily with the dial assembly.